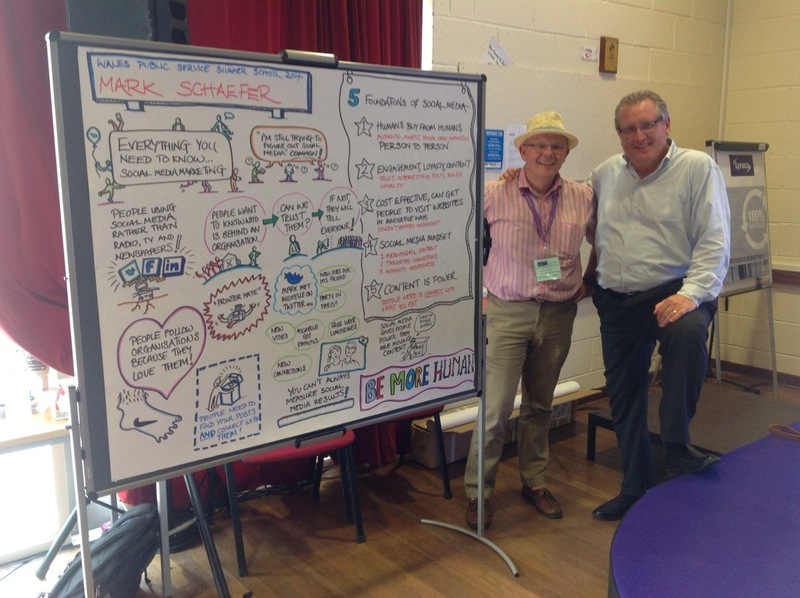 Huge thanks to Mark Schaefer for the midweek boost at Academi Wales Summer School. It was a fantastic gallop through ‘everything you need to know about social media marketing’, there’s a great graphic of the presentation at the end of the post. Its the third time I’ve seen Mark speak and as previously; he was very entertaining, highly thought provoking and completely human; which was his key takeaway: in the digital world, Be. More. Human, the Killer App. You can read more of what Mark has to say about Be More Human on his blog. This all made perfect sense to me, and I ended up in a (late night) conversation proposing that organisations should be more human. It went along the lines of …..If people are encouraged to be a bit more human, the organisation will be more human, and this will lead to good things like more trust and greater compassion. It was late at night, and I have been thinking about ‘can you teach compassion and kindness’ quite a lot recently. 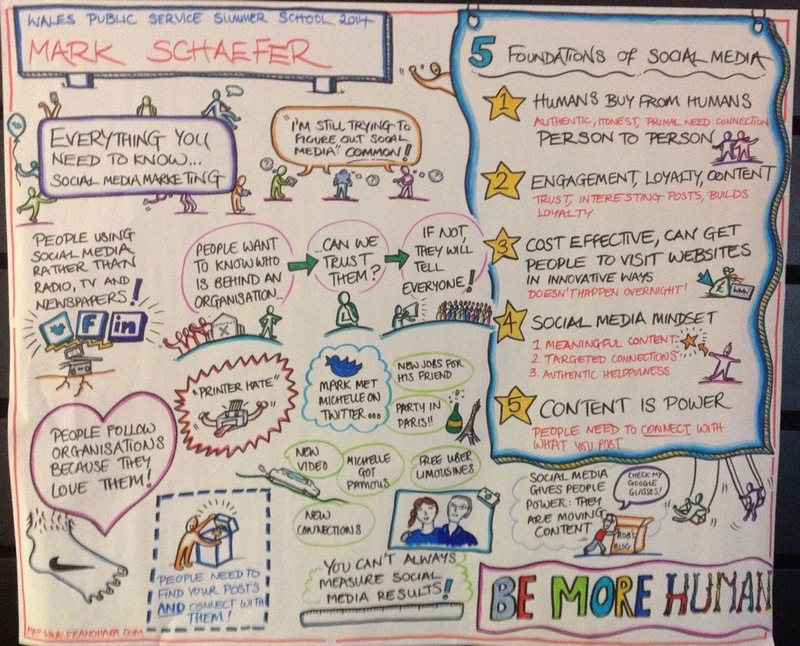 It seemed to me that by embracing social media, there was opportunity for Be More Human, which has so many benefits. Just to confirm the thinking is right, this morning I read, ‘how leaders can get more from social media’ where Helen Reynolds encourages CEOs to embrace social media and become more human. So, diving headfirst into social media is the right thing to do….. or is it? Designing out the Idiot. Many years ago I was involved in a project where one of the key success criteria was, ‘design out the idiot’. Our thinking had gone along the lines of; this process needs to work perfectly, the way people behave is the biggest problem we face, lets design it so that they cannot get it wrong. in the end most people ignored the process and found a better way to do the job. It was a massive failure. There is an interesting link here to how lots of organisations have behaved in relation to social media. When I think about a number of ‘design out the idiot’ social media policies I’ve seen over the years (and other HR policies for that matter), there is still a long distance to travel. Lack of Uniformity – no two people are alike, what is acceptable and reasonable for one person, may outrage the next person. Unpredictability – different groups of people respond differently to the same situation, and the same group may respond differently on different days, you just cannot accurately predict. Failure – people get things wrong, lots of the time. This can vary from completely accidental mistakes through to deliberate acts of sabotage and malicious compliance. So what can you do? If we want to Be More Human, we need to accept the human messiness that comes along with it; lack of uniformity, unpredictability and a fair bit of failure. This means a move away from the ‘design out the idiot’ approach and look for opportunities in what is going to happen anyway. Work with the grain of what is happening rather than try to constrain and prohibit. From my own experiences I think that it is price worth paying for the benefits you get. Let people have a go, let them fail, let them Be More Human. Perhaps social media is the best testing ground for people and organisations to try out if they are capable of becoming more human? If as public services we are mostly in the ‘people business’, maybe this should the the territory where we test ourselves – starting with the HR Professionals (well, they do write most of the policies). Thanks to Mark for being human and giving us the opportunity to think about how we Be. More. Human. Anything involving people is a messy old business. Trying to dehumanise processes and policies (design out the idiot) is pointless – we always find a way around. Social media might just offer the opportunity to test ourselves and ‘Be More Human’ – then apply that learning to everything else. Finally, remember; Be. More. Human. isn’t just for social media…. its for life. I should have taken the hat off – who wears a hat indoors, really what was I thinking…..
Our thinking had gone along the lines of; this process needs to work perfectly, the way people behave is the biggest problem we face, lets design it so that they cannot get it wrong. …….. i get the sentiment of the article but try implementing a solution for any gov’t dept > 75,000 users by not using the above as your battle plan and you’ll be explaining It all away for many years and enquiries to come. Apps/systems of any notable size with any thing remotely diverse in its user community make up fail wherever they go down a nurturing rather than the mandatory roads. The case for open human systems strengthens as the size of the community reduces and it’s uniformity increases. I wish it weren’t so. I recognise the problem, a massively complicated system in the first place, like tax or benefits, that some what’s to ‘simplify’ by sticking it online, without looking at what’s underneath in the first place. I was going to say, “ooh, what about Facebook and EBay, they are apps that work for everyone” – then it occurred to me – they aren’t based on systems that have been concocted by government officials and politicians over decades. An app for flogging off you fashion faux pas is probably going to be easier than something that works out your tax return (I guess). The difference for where EBay etc might operate comes around how end users are perceived. With the ancient example I used our end users were considered to idiots. I think this got us into trouble. I have a feeling that lots of things like social media (and HR) policies are still developed from this perspective. If I can breath sufficiently to talk. Be More Human … mmm! Have to admit to bring a bit reticent about that mantra. Especially when coming from overexited eloquent middle class types. Then of course, the message is an old one and in some senses well founded. I think Mary Parker Follet, who pretty much invented organisational psychology/theory in the C19th, said the same thing albeit in more words. I always think how can you not be human? Then as the sun comes out, and twitter takes off, I’m inundated be the smiley brigade, twonking out their platitudes of vacuous optimism, in the hope that being slightly more smiley will solve all the problems. And then I sort of got, the Be More Human part. It’s all the human bits, not just the superficial well meaning variety ie including the inevitable idiots. Mary could see a world full of colour and texture being swallowed up by some rich men, intent in turning everything into a wonderful machine. Industrial revolution on a god like scale with all its Newtonian splendidness. Although we are still suffering the after effects of that, it’s not the same problem. And your jibes at corporate policy twonks, made me chuckle. If you combine Be More Human (accept diversity) with Jon Robson’s Psychopath Test (1 in 4 corporate leaders), with your mistrust of HR (enforcing standardisation), then it all falls into place for me. It’s only the psychopaths, that need to be more human, the rest of us find it remarkably easy! Great post!